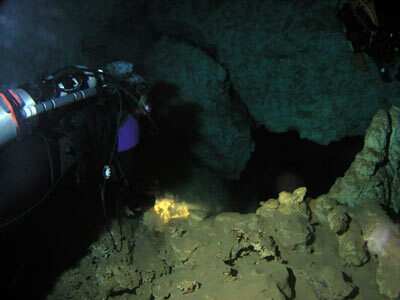 I have not done many "real" cave dives. 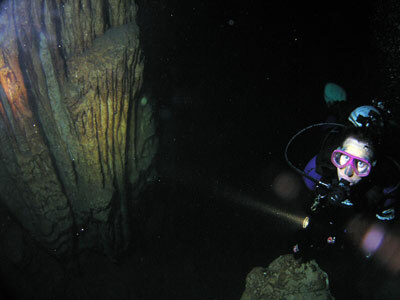 Back in 1991 I dived Chandelier Cave in Palau. This is a salt water dive but is into a now submerged limestone cave that extends back into an island. In 1993 I dived Devils Grotto on the Isle of Pines in New Caledonia. This is a true cave. 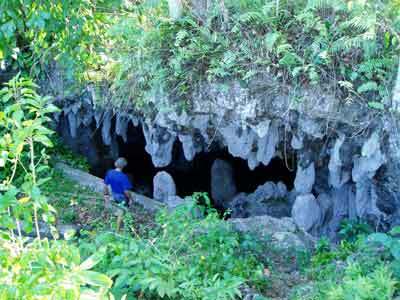 On the island of New Ireland in Papua New Guinea there are a number of known freshwater caves that can be dived. There are also likely to be lots more that have not been discovered. Near Kavieng at the northern end of the island there are two caves that can be dived. Both of these are not huge and do not really offer much to the true caving enthusiast. 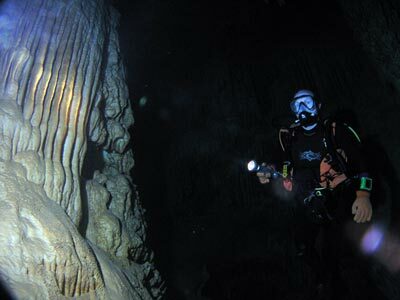 However, for people like me who have not done many cave dives, it is an excellent opportunity to do a cave dive. The larger of the two caves is Liga Onui Cave. This means "Place of Drinking Water". During World War II the cave was used as an extraction point by the Japanese for water. Outside the top of the cave a engine and pump were (mounted (you can still see where) and a pipe run into the water. The pipe can also still be seen (see later). Even today, the cave is the source of water for some of the nearby residents. As such, very strict conditions apply to diving the cave. 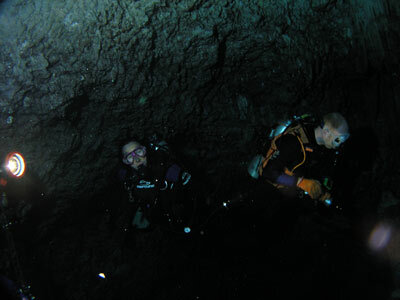 It took the dive operators, Dorian and Cara, many years to secure permission to dive the cave after some divers basically trashed the cave with their very poor diving abilities and then showed the video to people. Before you are permitted to do this dive, you must show Dorian that you are very good with your buoyancy. Unless you pass this test, you cannot do the dive. In addition, cameras are normally not permitted to be carried. Only three divers can accompany Dorian on a dive. Before the dive, Dorian goes to the home of the owner of the property and checks in. He also does this at the end of the dive to make sure that the owner knows that we are finished. To get to the Liga Onui Cave you drive towards the airport and then turn left onto the main highway that runs down the east side of the island. This takes you around the end of the runway to the other side of the airport. You travel down to a place east of the southern end of the runway. Here you take a track off to the right and go up a few hundred metres. The cave is a hole in the side of the small hill and about 20 metres across. You gear up and walk down the very narrow and slippery track to the water's edge. The climb is not as long or steep as that at Shiprock in Sydney, but in some ways is more difficult. As you go, you have to be very careful not to slip or step on the silty bottom as this is totally banned as it will contaminate the water. If you are not fit, forget about this dive. Once at the water's edge, you put your fins on and slip into the water. The cave is sort of shaped like a C as you look at it. At the half way of the C there is a bit that heads off to the left. This is the deepest point of the cave, 20 metres. The cave has large air space at the entrance. You follow Dorian into the cave. There is a red line that runs through the cave in case you do get separated. Straight away you see stalactites and stalagmites. The water is crystal clear, at least 40 metres. It is relatively tight in the first sections and you travel in single file. However, as you descend the water gets less clear. 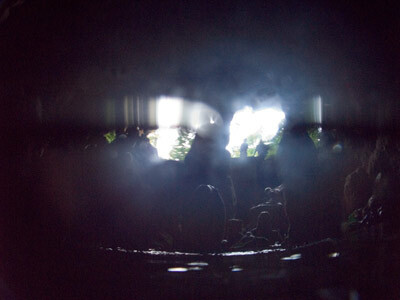 This is not because the water is dirty, but because there are different layers of water in the cave. Despite the water being fresh at the top, there are other layers of water that are saline and even salty. This causes a refraction exactly like the more common thermocline that can be seen in the ocean when there are two distinct layers of water with different temperatures. This is called a halocline and looks like wrinkled glass often used in bathroom windows. When I tasted the water at the deepest point it was very salty and undrinkable. The cave goes down to the left and then right. When you get to the middle of the C you turn left and drop down to the deepest point. This is only perhaps 20 metres long. From here you come back to the intersection and turn left. This takes you to the top end of the C.
This is shallower at about 10 metres. At this spot the cave is the largest. It is quite open here and there are some lovely formations. From here you backtrack to the entrance. There is a different route for the last section that also brings you back to the exit spot. As you go, look for the remains of the Japanese water pipe that can be seen on the bottom. There are also Japanese bottles and bowls. The dive time is about 20 to 25 minutes. Again, care needs to be taken when exiting the water to not stir up the bottom and when walking up the track. As mentioned, the visibility is at least 40 metres and the water temperature was 27.5ºC. This is not a dive for everyone, it is not even for dedicated cave divers as they would find it too boring, but it is a good experience.